I think my life has been guided as much by Walter Mitty as by any other fictional character. The weird thing is that, against all odds (there, I’ve said it), crazy improbabilities seem to drop into my lap with alarming frequency. In the Space Shuttle Flight Simulator. Pilots – please don’t hate me. I’d hate me too, but I swear I didn’t do it on purpose. It was just the dumb luck of being in the right place at the right time. 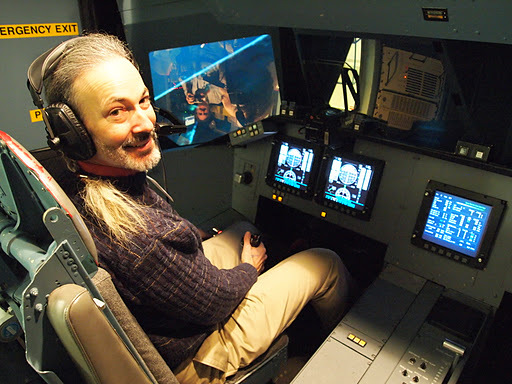 Yes, I just got to spend about 45 minutes riding jumpseat as Captain Chesley “Sully” Sullenberger (“Miracle on the Hudson” and all that) got to try landing the Space Shuttle (America’s other big white glider) under a half dozen or so different scenarios. The NASA guys were having fun: What if we give him low cloud cover? A short, unmarked emergency runway? Faulty nav? Okay, let’s blow out a tire or two! Yes, he nailed it almost every time. I swear, there’s no good reason why I got to be the guy back there in the jumpseat – Cliff had set up the invitation to get Sully to come down to visit Google; Tiffany had arranged for a visit across the way with her friends at NASA – I was just tagging along. But when Sully and the NASA guy climbed into the sim and were getting started, that jumpseat was just sitting there unoccupied. I looked around, pointed, and the techs on the ground gave me a “be our guest” look. I assure you I did not hesitate – not one instant. jump seat just behind and to the right. I’ve got to be honest, though – getting to ride the sim was good, but getting to spend some time talking airplanes with Sully was priceless. Some people work hard at radiating greatness. They act important and try to look the part. They want you to know. Sully (may I call you “Sully”?) is inspiring in an entirely different way. He smiles and moves easily in a way that says “Hey, I’m just a normal guy.” He insists that – contrary to all the media hoopla – he’s not a hero. He’s a well-trained professional who just did what he was trained to do. And he reminds you that there were four other such professionals on Flight 1549 – first officer Jeff Skiles, flight attendants Donna Dent, Doreen Welsh and Sheila Dail – all of whom worked together as a seamless team to bring the flight to its remarkable conclusion. They all just did what they were trained to do. He’s very clear that he didn’t ask for this fame – he was (again), just doing his job. But since long before that dip in the Hudson, he’d been a student of aviation safety. He became a fighter pilot after graduating from the Air Force Academy, and when not behind the stick, helped conduct accident investigations for NASA and the Air Force. Few pilots, even captains with 20,000 flight hours and 20 years of seniority, can support a family on an airline salary any more. So like many, he had a business on the side. His was a consulting company: Safety Reliability Methods Inc., providing “emergency management, safety strategies and performance monitoring to the aviation industry”. So in one sense, yes he was just doing what he was trained to do. But it’s hard to imagine anyone who’d been better prepared by their training. Anyhow. Inspiring. What can I say? Other than “Please don’t hate me”? good work getting video. that's definitely the voice that said, "we'll be in the hudson". I don't hate you, Pablo.I'm just insanely jealous.Wow. This is just wonderful.I am concerned, however, by the apparent quick decrease in your MTBIE (Mean Time Between Improbable Events). Best ease up, lest you fold up into yourself and vanish in a puff of infeasibility.